In our family, a holiday meal is not complete without an antipasto platter. 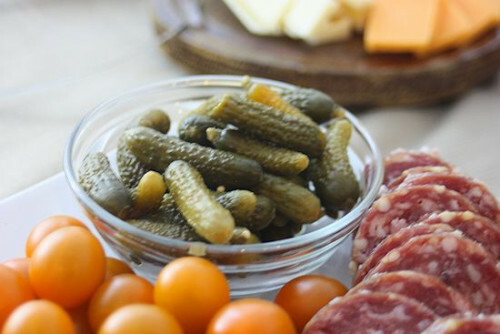 Growing up, both my husband and I looked forward to our respective family traditional platter – my family’s included black olives that were quickly devoured by all of the cousins, and my in-laws always had pepperoni or salame. 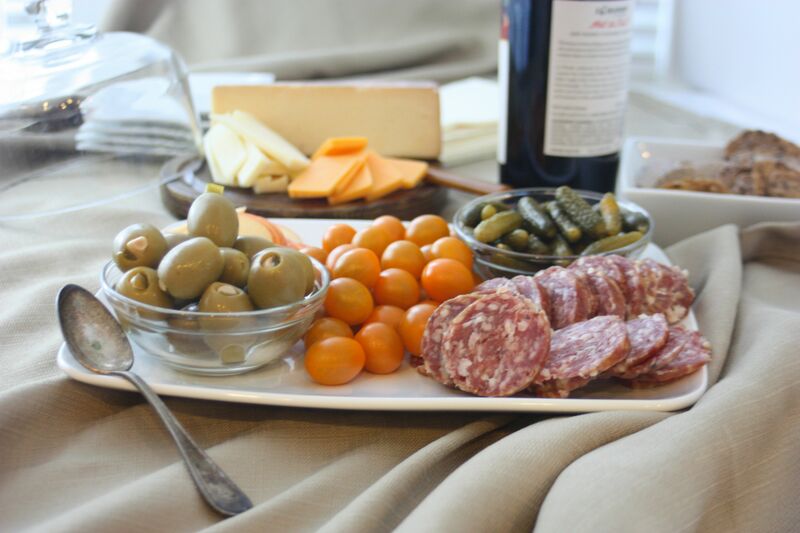 Antipasto, or “before the meal”, platters are appetizers that are an array of cured meats, olives, and cheeses. Some also included other brined or marinated items such as mushrooms or peppers. This year, my antipasto platter gives a nod to both of our traditional platters while adding a few other items that represent family heritage and our continued exploration into the world of cheese. Instead of pepperoni, I have sliced up salame (did you know that salami is the plural of salame, but in English we use it interchangeably as a singular and plural word?) veneto, which is a traditionally cured pork salame. I am trying to resist eating a whole jar of black olives by myself, so I have folded and added the garlic and jalepeno stuffed green olives, my husband’s latest favorite in the olive arena. They really are addictive, but truth be told, your favorite olive would be an equally as tasty replacement. I have also added cornichons, which are French style baby gherkins. My grandmother of Belgian heritage always had them at family gatherings, holiday or not. I hadn’t had them in such a long time, that when I saw them this year I just knew they had to be a part of my holiday celebrations going forward. We are always on the hunt for a new favorite cheese, so the never-tried-before (and not sponsored, this is really just a random selection) cheese added to my platter was the Sartori Raspberry Bellavitano. It is a Parmesan with a creamy finish and a faint hint of raspberry flavor. Our spread is rounded out with two types of cheddar – sharp yellow and horseradish white – some gala apples, and cherry tomatoes. Let me know what you can’t live without when it comes to an antipasto platter. As you can see I am always adding or subtracting to ours! Place the green olives and the cornichons in two, separate small bowls. 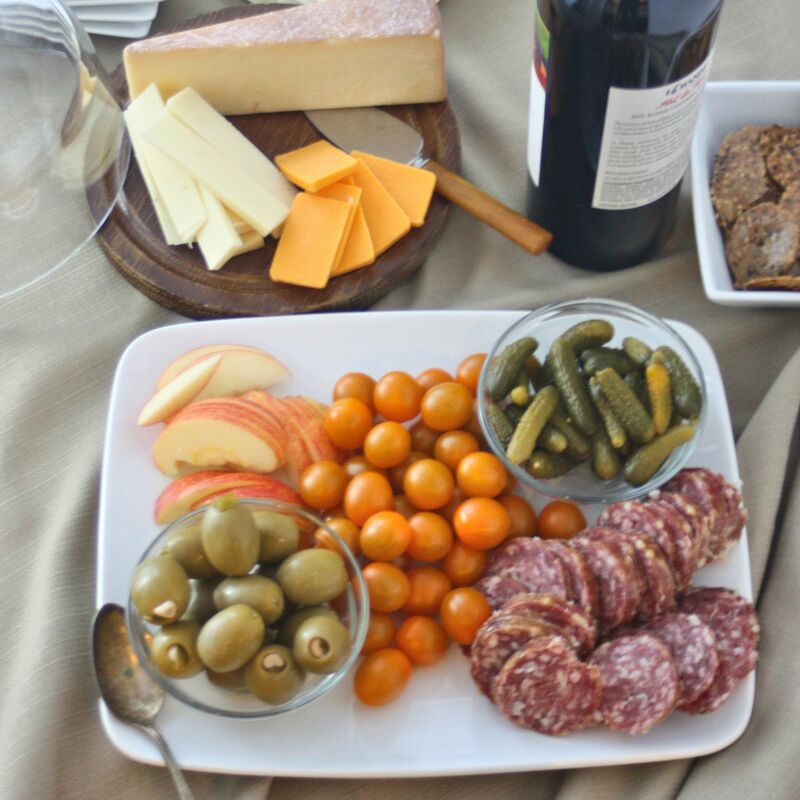 Place the bowls on a large platter and surround them with the salame slices, apple slices, cheese, and tomatoes. Serve immediately as an appetizer.